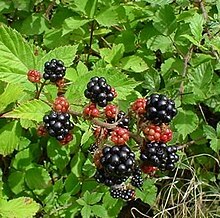 Rubus is a lairge an diverse genus o flouerin plants in the rose faimily, Rosaceae, subfaimily Rosoideae, wi 250–700 species. Raspberries, blackberries, an dewberries are common, widely distributit members o the genus. ↑ 1.0 1.1 "Rubus L". Germplasm Resources Information Network. United States Department of Agriculture. 2007-10-05. Retrieved 2010-06-27. ↑ "Rubus L". TROPICOS. Missouri Botanical Garden. Retrieved 2010-06-27. This page wis last eeditit on 31 Julie 2016, at 18:16.